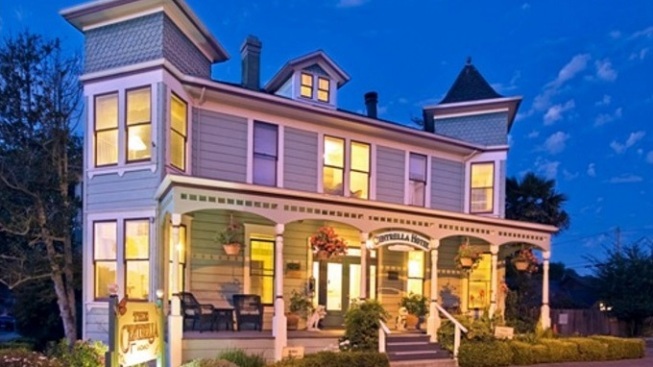 Some of the town's quaintest B&Bs up the quaint-a-tude for a seasonal tour. Visit several sweet spots on Tuesday, Dec. 1 and Wednesday, Dec. 2 for a quaint kick-off to the season of bows and wreaths. CANDLES, CAROLS, CARDS: It's pretty rare to come across a seasonal greeting card that has a modern home on the front, one with a driveway and sprinklers and a garage and several of the convenient design and architectural features many of us live with nowadays. Spying an illustrated wreath on a garage door, or poinsettias dotting the garden of a split-level home, might actually be rather novel, and cheerful, but nostalgia, and the passage of time, are very much behind our most potent symbols of the season. So while we may not see modern homes on greeting cards, we do frequently spy Victorian-type manors, and not just on the front of our paper goods, either. Victorian abodes done up in their best Christmas finery dot cookie tins and food packaging and wrapping paper as well as greeting cards, so to say that these stately structures are a part of our deeper yuletide yearnings might be a bit of an understatement. But how does one go beyond the greeting card and into an actual Victorian that's decorated for the holidays? You don't need to slip through a rip in the space-time continuum; you only need to get to Pacific Grove, a location that happens to have several of these pretty places, over the first two days of December. TUESDAY, DEC. 1 AND WEDNESDAY, DEC. 2... are the 2015 dates for Christmas in the Inns, an annual self-guided stroll-and-see treat that spotlights a number of ye olde-y bed & breakfasts in the butterfly-iest town in the state. Actually "spotlights" connotes a glaring light of sorts, so let's say "candlelights" here, as the evening comes with softly lit pleasures rife with lace curtains, gentle carols, and the occasional doily, too. (Aside: Why does one long to see more doilies come the Christmas season? Discuss.) Five inns will open their doors on the first night -- hello Seven Gables Inn and more beauties -- and five more will welcome visitors on Dec. 2. Carolers, treats, trees, twinkly lights, ornaments, and all of the Victorian-esque details fit for a greeting card cover or cookie tin lid await. Tickets? It's a $20 donation. COULD... our modern homes, the houses built in the last two decades, one day, a century now, also be on such holiday tours, complete with costumes and carols? Might we see garages and swimming pools on the lids of cookie tins, too? Time has an interesting way of, almost overnight, flooding what was new with nostalgia. Ponder this as you tie your scarf and hum an old-school carol and make for PG.